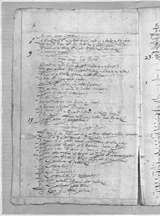 This is a list of 600 paintings belonging to James, 1st Duke of Hamilton. They were packed into 40 cases, with a note to the effect that there were also '12 cases with 28 of the best of the statues'. In the 26th packing case was the famous 'Daniel in the Lions Denne of Reubens'. This list is undated, but it was probably made at the end of 1643, just before the duke was imprisoned by Charles I in Pendennis Castle on suspicion of treason. The duke was one of a circle of collectors of Old Master paintings, instructing his brother-in-law, Lord Basil Feilding, to buy up the contents of studios in Italy for him. It has often been claimed that he had no interest in pictures himself but purchased them so that he could ingratiate himself further with Charles I, an ardent collector, by passing them on to him. There is ample evidence, however, that the duke was equally enthusiastic and when he built a new house for himself at Chelsea in 1639, he installed a large gallery. The present inventory gives a glimpse of the richness of his collection. It enumerates paintings by Titian, Raphael, Correggio, Palma Vecchio and Bassano, almost all showing religious or mythological scenes and also landscapes and still life pictures. In the same case as the 'Daniel' were Van Dyck's portraits of the duke himself and his wife, her father Lord Denbigh and Mary, Duchess of Richmond (now in the North Carolina Museum of Art).